The so-called $100 laptop has undergone a facelift in order to be used by secondary school children. The machines, designed by One Laptop per Child (OLPC), are based on the original XO laptop, which was built for primary school children. The new computers feature a larger keyboard and upgraded software. 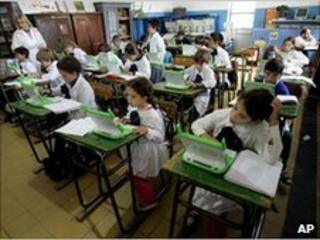 Uruguay, which has already distributed nearly 400,000 XO laptops to primary schools, has ordered 90,000 of the new laptops, known as the XO-HS. It has also ordered 10,000 machines designed by rival Intel, which makes the Classmate PC, also developed for children. "We want to see how students react and analyze the advantages and disadvantages of each," said Miguel Brechner, director of the Technological Laboratory of Uruguay, who is in charge of the country's Plan Ceibal (Education Connect) project. The government scheme has given many people in the country their first taste of computers and the internet. It has delivered 380,000 XO laptops to primary school students and nearly 20,000 to teachers. "Uruguay is the only deployment that is complete," Kalil Nicolas of the OLPC Association, told BBC News. "They have full saturation of their primary schools." The 90,000 XO-HS machines will be rolled out to some of Uruguay's 230,000 high school students. "We are expanding our reach," said Mr Nicolas. "We still want to focus on 6-12 year olds - and motivate them - but they need a laptop to grow into." Deliveries of the new laptops will begin in September 2010. Mr Nicolas said that they would also be offered to other countries interested in connecting high-school students. The original XO laptop was designed specifically for children in the developing world and featured a rugged design aimed at keeping out water and dust, a sunlight-readable display and open source software. It was designed by OLPC, a spin out from US university MIT. The organisation originally aimed to sell the green and white machines in lots of one million to governments in developing countries for $100 each. However, it had difficulty getting governments to commit to bulk orders. Mr Nicolas said that 1.2 million machines had been deployed so far and OLPC was contracted to supply a further 500,000. Each laptop ordered by Uruguay cost $209. The new XO-HS laptops will be based on the same design as the original, but will be tweaked to appeal to be used by older children. In particular, it will feature a larger keyboard better suited to older students and will be offered in different colours to the original machines. Although it will have the ability to run two operating systems - including Microsoft Windows - the project has chosen to use Linux. It is one of the most significant changes to the machine's outward appearance since it was first launched. However, a more radical transformation could be on the horizon. Earlier this year, OLPC founder Nichols Negroponte recently announced a partnership with chip-maker Marvell to design a touchscreen tablet computer. The firm had previously announced a prototype of a similar device, which Mr Negroponte said could cost as little as $75. The machine - known as the XO-3 - promises wi-fi, high-quality video and stills cameras, 3D graphics and low power consumption. It could be launched as early as 2011.